These were the Washington Post front page headlines on Monday, November 13—Kevin Sieff's chilling story about boys from South Sudan who had pledged to lay down their arms in 2015. According to the United Nations, 115,000 child soldiers have been released globally since 2015. But Kevin Sieff tells us the numbers of child soldiers in Yemen, Iraq, and other countries are rising. Reading the story, I thought of Grace Akallo, a young Aboke woman who was abducted from her boarding school in Uganda by the Lords' Resistance Army and forced to become a soldier. She was brave—and she was fortunate: She was among those who escaped. Eventually, she was able to return to school. She later moved to this country where she received a college education. 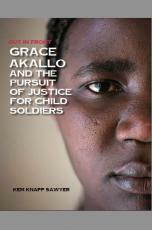 Grace has gone on to speak out against the use of child soldiers—testifying to Congress and at the United Nations. She has strength and determination and a desire to help and counsel others who have shared her past. And Grace has a home. But that is not the case for the former South Sudanese child soldiers in the story I just read. Reporter Kevin Sieff tells us 115,000 child soldiers have been released globally since 2015. Yet the numbers of child soldiers in Yemen, Iraq, and other countries are rising. For some alternatives are hard to come by. We need more people to hear Grace's story. And we need more people like Grace to tell their story.